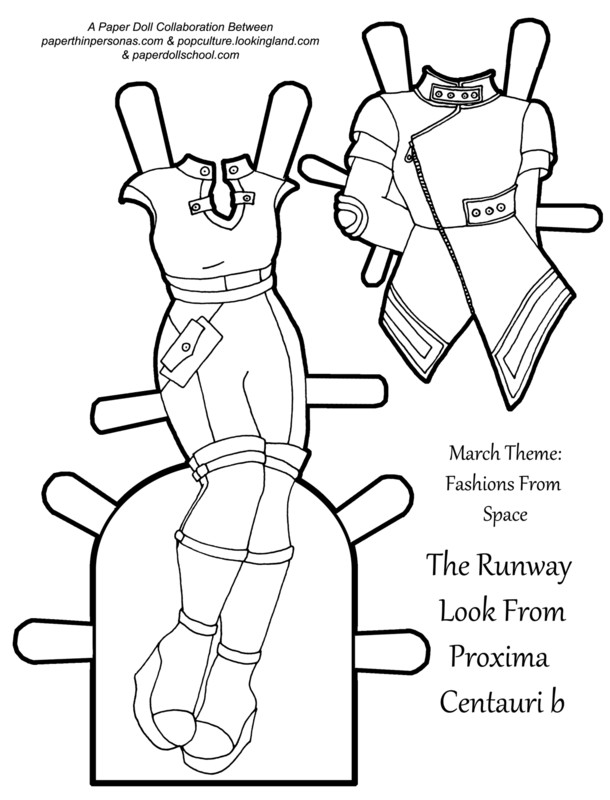 Today’s Paper Doll Collaboration 2017 outfit theme was “Fashions from Space” so I am super pleased to present an outfit straight of the Spring 2647 runway from the planet Proxima Centauri B.
Proxima Centauri B is the closest known planet to Earth to be in the “goldilocks zone” where liquid water could exist on the surface of the planet, making it potentially habitable. According to my careful research (okay, so I really just read the Wikipedia article) Proxima Centauri B is regularly buffeted by solar winds and has a rocky icy surface. So, in my imaginary space future, the colonies on the planet are actually subterranean and in enclosed domes. Due to the cold temps, the runway looks from Proxima Centauri B are cute, but functional. The thermal trousers and heavy boots are accompanied by a cap-sleeves insulated shell. Over that, our model wears an asymmetrical coat with elbow patches. Ever since the military conflict between the Inner Colonies, closer to Earth, and the Outer Colonies, further from Earth, heated up back in 2642, there has been a real military influence on fashion and that can be seen in this look from Proxima Centauri B‘s runways. Looking for more Space fashions? Then check out Popculture and Paper Dolls, Miss. Missy and Paper Doll School. We’re all teaming up on this project, so I’m sure they have some great looks to share, too. I love the jacket, too. Super stylish alien! The double capped sleeves are really well done.